Google Bulletin is a new app that Google is rolling out in selected areas. The app allows users to post and share what’s happening in their local communities. The lightweight app makes it easy to write stories, upload photos, and post videos without creating a blog or website. For example, if a fire breaks out, you can quickly post what you know about the incident and share it with the rest of the world. The app is great for posting quick updates on an existing event using their mobile phones. Google claims that Google Bulletin stories are public and easy to discover on Google search, on social media networks, and through links sent via email or messaging apps. All you need to start posting is a smartphone (and of course, an Internet connection). Facebook and Twitter already make it easy to share happenings in your local community. What sets Google Bulletin apart is the ability to be shown and searched on the Google search engine. Facebook and Twitter status updates usually take longer to be indexed on Google, or may not be indexed at all. This app could be a real game changer if it gains widespread acceptance, especially during times of natural calamities where up-to-the-minute news updates are critical. While Google Bulletin is good news for amateur or wannabe journalists, there’s a possibility that it could spread misinformation. 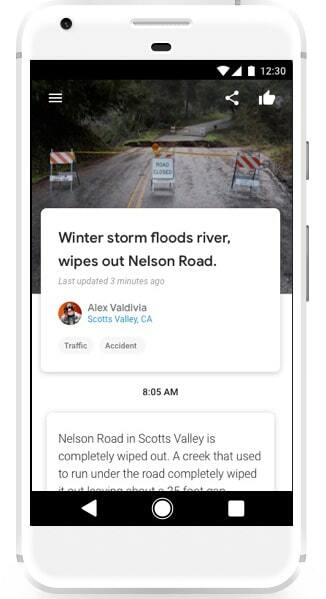 The app could possibly become a tool for disseminating fake news stories. We can only hope that Google will put up safeguards and measures in place to deter the spread of fake news. So far, Google Bulletin is still on a pilot stage and available only to residents of Nashville, Tennesse and Oakland, California. No word yet as to when it will be available to everyone.